Recognizing that all structural components produce sound, Steingraeber uses only the most natural and resonating materials. The wood is never impregnated with chemicals, and only natural glues and paints are used in the case and acoustics area, including the iron frame,. The cabinetry consists only of solid wood – particleboard is never used in a Steingraeber instrument. Steingraeber painstakingly selects the spruce used in its soundboards from valleys near Passau in eastern Bavaria. 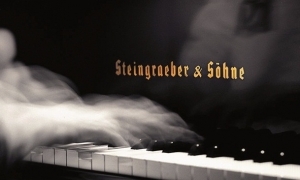 Each soundboard is tested and optimized individually and the dynamic range of Steingraeber is unmatched; a Steingraeber will play with more thundering power and also with more delicate subtlety than any other instrument. Coupled with Steingraeber’s action, employing Renner parts designed by Steingraeber, the completed product is without peer. This is truly a connoisseurs piano. Musicians choose R. KASSMAN above all San Francisco & Bay Area piano shops because of our exceptional selection of custom, new and used pianos and our knowledgeable, experienced customer service. Come into our Berkeley, California piano showroom to see, touch, and play our exquisite Steingraeber pianos for yourself.